This week, I read a paper about ices on Mercury. Initially, the paper's topic didn't phase me. My research focuses on chemistry in giant clouds of dust and gas in the interstellar medium (ISM), where temperatures can be as cold as 10 K (-440°F). In these clouds, where stars will eventually be born, much of the chemistry is thought to happen on the surface of ice, so I'm used to reading about ice and chemistry in extreme places. As I started to read the paper, however, I was struck. How can Mercury, being so close to the Sun, have any ice on its surface at all? Sure, I'm used to extreme as an astrochemist. But this level of extreme...? Mercury is the planet closest to the Sun at a distance of about 0.4 AU (1 AU, or Astronomical Unit, is the distance between Earth and the Sun). Being so close to the Sun, Mercury has an orbit of about 88 Earth days, thus it goes around the Sun more than four times for every time we do. Furthermore, it has a 3:2 spin-orbit resonance, meaning it rotates three times for every two revolutions around the Sun; this causes one day on Mercury to last about two Earth-years. Mercury also has next to no atmosphere to keep heat in or to protect its surface from the Sun's radiation. Because of this, nightside temperatures can be as cold as 100 K (-280°F) and dayside temperatures can reach 700 K (800°F) on the planet's surface. Mercury's hot dayside temperatures make water ice on the surface unfathomable, and yet, it is there. Much of this is because of Mercury's obliquity, or axial tilt. Earth has an obliquity of about 23°. This axial tilt is what gives us the seasons. In January, for instance, the Earth's tilt means the northern hemisphere is pointed away from the Sun and receives less of its warmth, causing winter; in the southern hemisphere, however, January means being pointed toward the Sun to receive relatively more warmth, making it summer. Illustration of axial tilt being responsible for Earth's seasons. 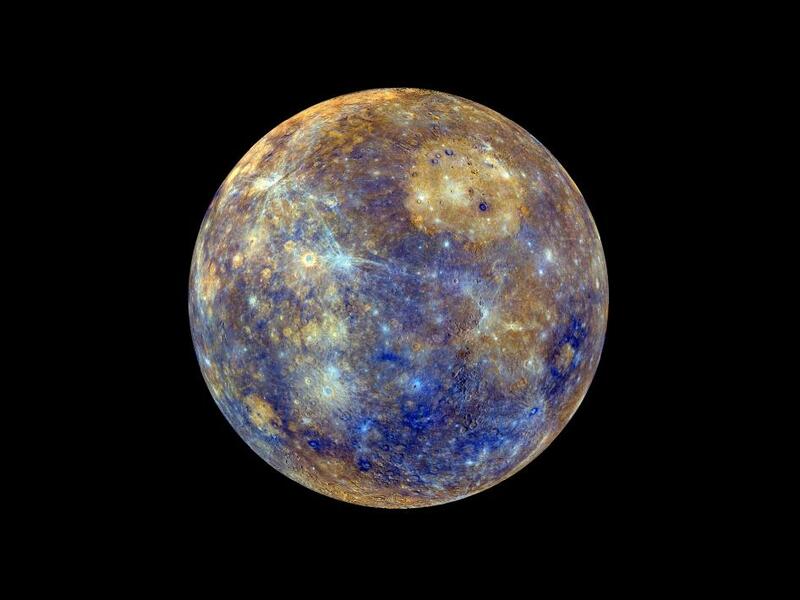 Unlike Earth, Mercury has an obliquity of about 0°, meaning it has no axial tilt. No axial tilt means no seasons, so any given region of Mercury receives the same solar radiation regardless of where the planet is in its journey around the Sun. Way up north, at high latitudes, the depths of gaping craters never see direct sunlight. Instead, they only receive scattered light. This permanent shadow keeps them cold, much like a cave on Earth that keeps a fairly constant and cool temperature year round because it is hidden from direct sunlight. Only in the case of Mercury, this permanent cold is more than chilly; it is thought that it can stay as cold as the nightside of Mercury at 100 K (-280°F), making the depths of these craters suitable for stable water ice, even on a planet so close to the Sun. The deep regions of Mercury's craters at high latitudes never receive direct sunlight, allowing water ice to persist there. If Mercury had an axial tilt, however, the picture would be quite different. In reality, however, much of these regions are exposed to temperatures much higher than what is expected for stable water ice on Mercury. While 175 K (-145°F) is certainly much colder than the freezing point of water on Earth, which is 273 K (32°F), these "high" temperatures aren't cold enough for stable water ice. Recall that Mercury has very little atmosphere. Therefore, the ice in these craters are exposed to vacuum-like conditions, and at such exceedingly low pressures water ice easily sublimates—or changes directly from a solid (ice) into a gas (vapor)—even at low temperatures. And yet, the ice persists. Images of the craters on Mercury show dark patches within, but these dark patches aren't the permanent shadows. Rather, these images, like the one below, are Infrared images, meaning they are pictures taken at wavelengths of light longer than what our eyes can see. This dark material uniformly covers the same regions where ice has been detected, but what is it? One thought is that the dark patches correspond to a layer of organic material covering the ices. Infrared image showing dark material coating inner craters at high latitudes on Mercury, as seen with the MESSENGER space craft and published by Delitsky et al. (2017). Consider some dark materials: graphite (pencil lead), coal, soot. These materials are made up of organic compounds (which in turn are carbon, hydrogen, and perhaps some other atoms bonded together). While the images of the dark material don't necessarily point towards layers of organic materials, the presence of these types of chemicals would make sense of the curious presence of water ice. Organic material, as well as water, is delivered by comets and meteorites. After the organic material lands in the craters, it probably reacts with both the water ice therein and stray radiation from the Sun. As the material reacts, it forms a crusty organic layer (think of the charred crust of a marshmallow after it has been roasted over a campfire) that protects the underlying ice. Organic material is collected deep in the craters near the poles of Mercury, where water ice is stable despite being so close to the Sun on a planet that reaches temperatures of 800°F. Through a combination of being cast in permanent shadow by the rims of craters and being shrouded in a crust of carbon-based chemistry, the presence of water ice on Mercury is certainly surprising, but plausible, and nothing short of remarkable.